For the past two weeks we’ve been enjoying our own bread. Two weeks ago my brother-in-law Tristan decided to make focaccia bread again after a long hiatus. He wanted a father-daughter Saturday afternoon activity with 5-year-old Lilo. So they trooped to Baker’s Depot at Robinson’s Galleria and bought bread flour (about PhP26/500gm), whole wheat flour (for roughly the same amount) and SAF-Instant yeast (PhP70/small pack). Needless to say, the bread was delicious toasted, with or without butter. It had a soft crumb and a lovely color from the olive oil spread on top of the loaves before the last ten minutes of baking. Next Joy wanted to make No Knead Bread. New York Times food columnist Mark Bittman popularized the recipe, by Jim Lahey of the Sullivan Street Bakery, in 2006. We saw chef Michael Smith make his version on his Asian Food Channel show Chef at Home. What convinced us was Jaden Hair’s Steamy Kitchen blog entry, showing her cute then-4-year-old son Andrew assembling the dough. 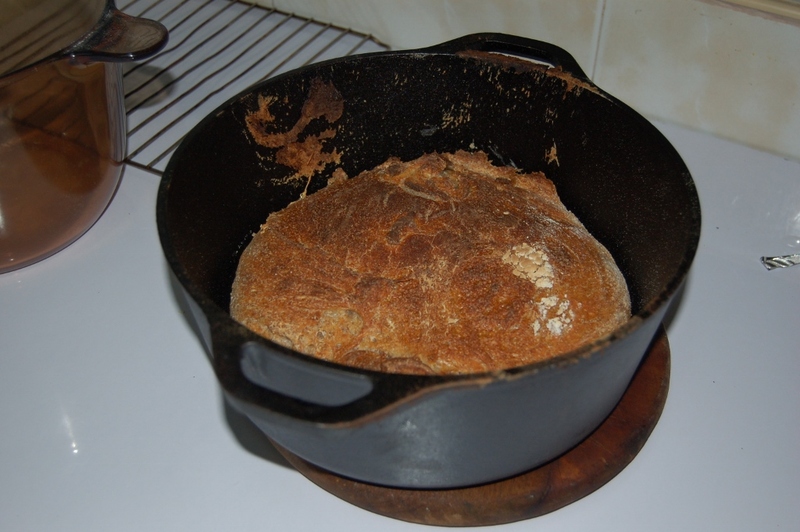 We are 5 years late to the baking-and-blogging NK Bread party, but then we only acquired a Lodge 5-quart cast iron Dutch oven some time last year (it was on sale at Gourdo’s, for something like PhP 2,500). The recipe requires a sturdy, heat-resistant baking vessel with a close-fitting cover, usually a heavy enamel casserole pot or a cast iron Dutch oven. It should be able to withstand 450 degrees F for an hour or so. 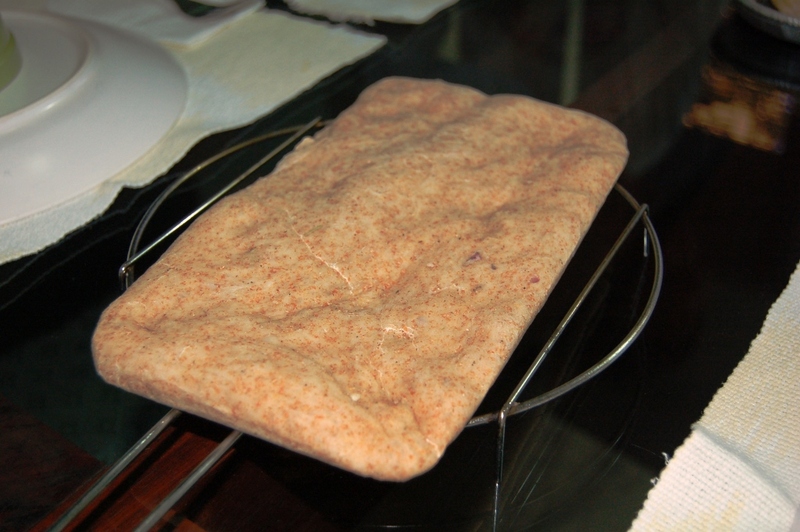 The blog 80 Breakfasts even tells us of a brave soul who made her NK Bread in a crockpot body covered with a ceramic plate, then baked inside a turbo broiler. Talk about ingenuity. We started after dinner one night and left the dough to rise overnight, producing a wetter dough than you see in the video or in the Steamy Kitchen blog. We’re not sure if it has something to do with the high humidity in the Philippines. Next time we’ll reduce the water from 1 1/2 cups to 1 1/4 cups. We’ll also use foil or baking parchment as a base when the dough undergoes its second rise; that way we can put the entire thing in the extremely hot cast iron Dutch oven safely. Letting the dough fall from the floured towel made a huge plop that deflated the dough. It also left some dough on the towel that was hard to scrape off (if you took all that trouble to prepare the dough, you wouldn’t want to lose some of it to the towel!). 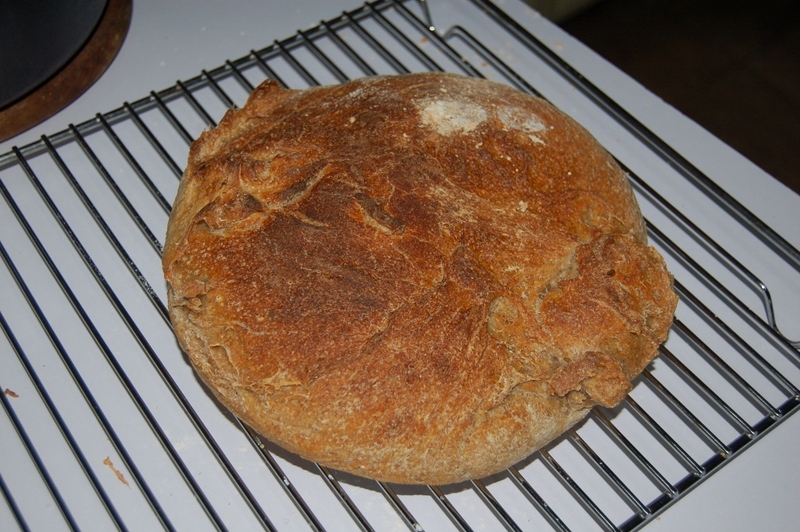 However, we ended up with an interesting 9″-round rustic whole wheat loaf that rose some 2 1/2 inches. We should have waited for it to cool completely, but we were too impatient. The bread had a tasty crust and a hole-y crumb. We slathered it in butter and nearly finished it in one sitting! We managed to leave a bit to go with the seafood chowder we had for dinner that same night. Yes, we’re making it again. I read through many other bloggers’ experiences with the recipe and we will make adjustments accordingly. We’d love for the bread to rise higher, but that would require a smaller, narrower (3-4 quart) Dutch oven. Many Filipinos prefer their bread soft and sweet, but we rather like the No Knead Bread precisely for the difference of its texture and flavor. It reminds us of French or Italian country breads, the boules and batards, the kind you toast and use to scrape up your delicious soup or gravy. The kind you dip in a mix of herbed olive oil and balsamic vinegar and enjoy as an appetizer. The kind you have toasted, spread with butter and honey for breakfast, because it doesn’t need much else. As an idea, it has romantic charm. The tasty reality is a very good thing. We’re eager to try other bread recipes, of course. The cost of liquid petroleum gas is up, but baking our own bread is worth it. 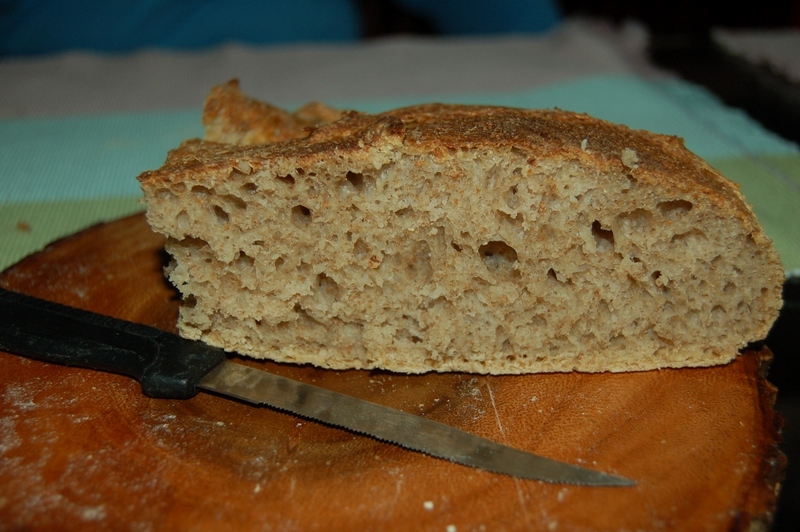 This entry was posted in Family, Food and tagged Baking, Bread by personalgeographic. Bookmark the permalink.